The spotlight this weekend was on the Davis Cup as titleholder, the United States, confronted France in the quarterfinals in Winston, North Carolina. 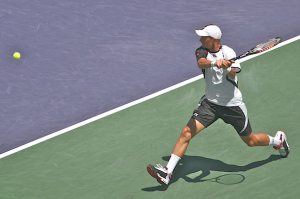 With a highly spirited crowd cheering him on, Andy Roddick took on Michael Llodra in the opening match on Friday. This turned out to be a close contest with Llodra being broken only once the entire match. Tie breaks determined the outcome of the second and third sets, allowing Roddick to prevail in three sets 6-4, 7-6, 7-6. Round two featured James Blake versus Paul-Henri Mathieu. 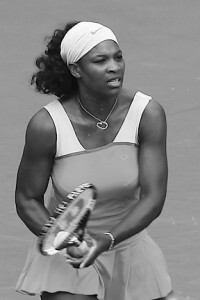 After splitting the first two sets, Blake won the third and looked to be in control of the match. But, Mathieu sprung back, winning the fourth. Considering Blake’s abysmal record in 5 set matches, US Captain Patrick McEnroe would have been justified in being alarmed. As the decisive set began, the likelihood of a lost loomed larger as France nosed out in front 2-1. Blake broke back to equalize things at 2-2. After that, things remained even until the 9th game when Mathieu converted a break point in a game in which he made an awesome down the line forehand. While serving for the match, Mathieu reacquainted himself with first serves, something which was absent throughout this set and went up 40-15. To his credit, Blake did not panic. On the next point which could have been the last, Blake used his speed to maintain himself in the match. Then, a couple of unforced errors by France leveled the set. After holding his own serve, Blake broke Mathieu to take the match and give the US a 2-0 lead 7-6, 6-7,6-3,3-6, 7-5. 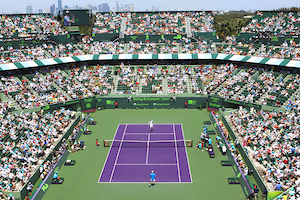 The next round of competition on Saturday had the Bryan brothers playing against the 2007 Wimbledon doubles champion, Arnaud Clement and Michael Llodra. After a tight first set which was decided in a tiebreak in the Americans’ favor, the French stepped up their game. The strategy of taking Clement out of his comfort zone and requiring him to come up with volleys and forehand shots, which are his weakness, at first paid off. But mid-second set, the more practice the Frenchman got, the better he became at executing these demanding shots. Furthermore, Llodra’s serve once again was on the mark picking up where he left off the previous day. Undeterred, the combination of all the aforementioned elements gave the Frenchmen the match and sustained the expectation that they could progress on to the next round 6-7, 7-5, 6-3, 6-4. On Sunday, France’s Mathieu faced Andy Roddick in the initial match. Mathieu, probably still in shock from the prior day’s result, offered no resistance. Roddick slammed the door on France, smoothly winning in three sets 6-2, 6-3, 6-2. A final obligatory match took place between Blake and Richard Gasquet in which the former was victorious. A perplexing question remained as to why Gasquet, as the top ranked player on the French squad, did not square off against Roddick instead. Thus, in September, the Americans will play the Spaniards in the semifinals in Spain; the latter eliminated Germany on German soil. The other semifinal will have Russia opposing Argentina. The Russians needed the home court advantage to eke out the win against the Czech Republic, while Argentina slid through against Sweden.